Serious Games classification usually deals with areas of appliance: Education, Health, Simulation, Gamification… The problem with this traditional method is that frontiers are really blurred. Where would you put a gamified e-learning that tries to improve children teeth-healthcare education? Like this one, there are hundreds of examples that don’t fit in a unique category. And why is this important? Because the differenciation by areas is preventing professionals of one branch to discover what it is being done in another. And sometimes both are researching about parallel or complementary subjects. This is why in this article we are going to propose a different classification: what we have called MAPPLE or Motivation, Awareness, Practice, Persuasion, Learning and Evaluation. All classification systems have their problems and limitations, we know, but our main purpose here is to break that area-barrier that prevent Serious Games information and advances to flow, for example, from e-Health to e-Learning and viceversa. Serious Games oriented to boost motivation try to make daily tasks that usually are repetitive and boring, engaging and fun. Gamification systems follow this scheme. You have a knee injury and have to exercise one hour everyday. The same tiring exercises again and again. What if, instead, you were playing a game that teaches you a weird dance? Or trying to beat a record kicking a virtual reality ball? Would that make your rehab time goes faster? Suddenly, you are not an injured person anymore, but a player trying to beat the clock or the best score. Time flies when you play, and even tedious tasks seem less unbearable. Imagine that you have to transcribe texts. Thousands and thousands of them. Do you think it is possible to make random people all around the world help you just because they enjoy it? Difficult, isn’t it? Darmouth University found the way with Smorball. 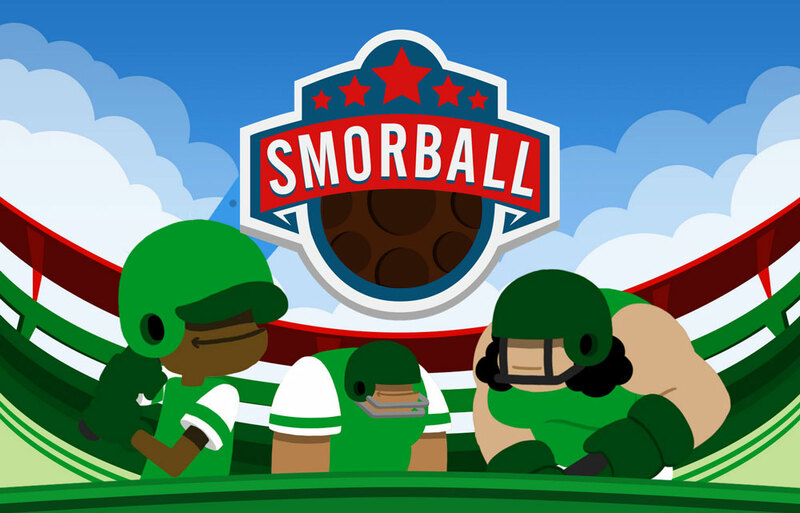 Smorball is simple and clever. You are not transcribing texts, you are protecting your football team from the attack of menacing robots. You need to type fast to send your players to stop the approaching machines. Cool! In a matter of seconds, you find yourself typing like crazy. Of course you won’t be playing the game for a long time, but probably it will trick you to offer your help selflessly for ten to twenty minutes. That’s how Serious Games can motivate people to do any boring activity… willingly! Serious Games focused on Awareness are changing the way we see and approach the problems of the world. Mass Media confront these problems showing us the worst part: blood, death, war. In the end, we have been immunized against violence. We don’t really care any more. Pity, the traditional sense targeted by awareness campaigns, has been almost erradicated from the “First World”. But we are not immunized against empathy and this is the path that Awareness focused Serious Games have chosen. If you feel what they feel, if you understand what it is like, you won’t be able to turn away. 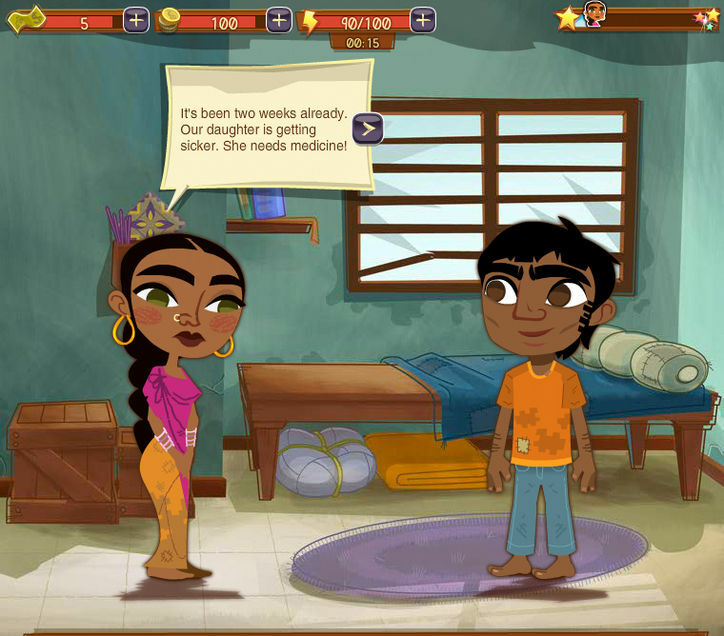 Empathy is difficult to be transmitted through newspapers, but games can do it. Half The Sky Movement takes a young woman in India and follows her through her process of empowerment. The first step is just to refuse to believe that her husband’s solution to a problem is the only possible one. Step by step, from little decissions to real life-changing ones, she will build a better future for her and the whole community. As a player, you won’t feel attacked or pushed to donate your money. You won’t need to watch videos that try to make you cry. And the effect will be better and more durable. You will learn about this woman’s every day life and understand her options and struggles self-discovering the whole story and not as a passive subject. 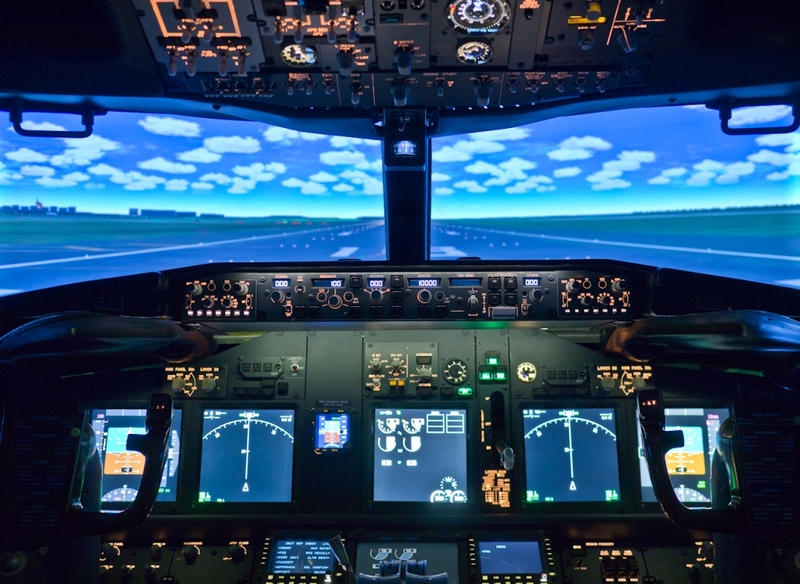 Probably the oldest and best known simulator, Flight Simulator, is the best way to describe “Practice” the third category in the MAPPLE organization. What would do pilots without the thousands of hours thay spend flying simulators? The practice even became mandatory to obtain a professional license. Being able to practice difficult tasks in a safe environment saves lives and, why deny it, money. Opel uses virtual reality simulators to allow employees to practice. They can practice the same tasks whenever they want so when they face the real problem, they will solve it in the shortest, cheapest possible way. Persuasion acts at its best when target subjects are relaxed and unaware of it. Commercials were the perfect way to attract buyers a few years back, but viewers have learnt the lesson and are more defensive against TV ads. When are potential buyers more likely to be relaxed and trusting? Leisure time is the key and audiovisual content is the best option to leave a message on target brains. So why not use video games? One of the most known advergames is the FIFA franchise. Kids watch on TV the soccer starts and then play with their friends as if they were a part of the team. Not only the price of the game is profitable, it is also the best catwalk for even more expensive merchandising and branding. Sports are not the only ones using advergaming, luxury cars have also find their place in the industry through franchises like Need for Speed. 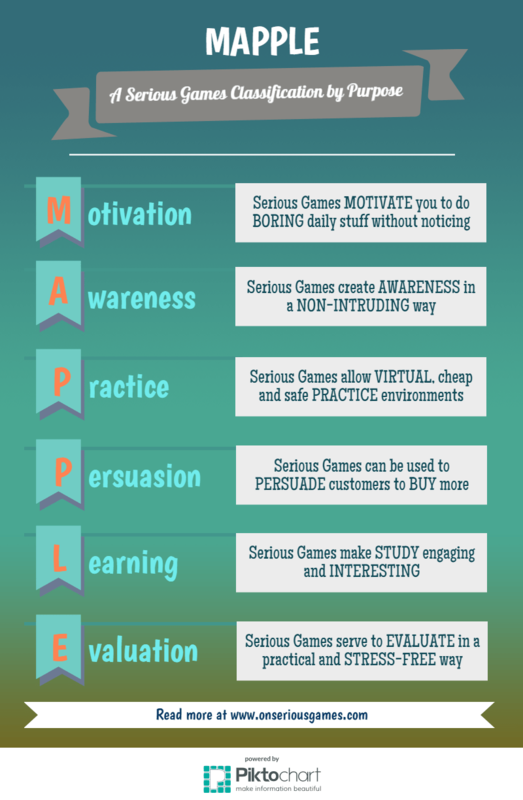 Without a doubt, the best known Serious Games field of application is Learning. In the last decade, teachers from all over the world have been applying the advantages of games to their boring, dense but fundamental lessons. Educating XXI century kids with XVIII century technics is taking its toll. Disinterest, lack of motivation, drop out… Education is in need of a change and Serious Games are being claimed to be the solution. But noy only children could benefit for the change. Triskelion is a serious game to learn to manage time and stress. 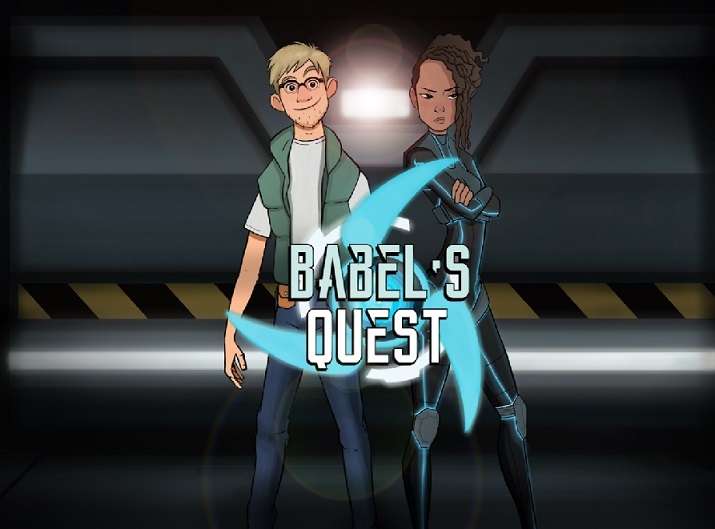 Through a graphic adventure players learn to mechanize good habits while trying to find the secret of happiness protected for centuries by a secret organization. Instead of reading manuals or self-help books, employees play an interesting game and focus not in learning but in unveil the mistery. Learning becomes the secondary objective and thus it is interiorized in natural way. Last MAPPLE categoty is Evaluation. We can see that all previous categories share a common element: games that help people do things they don’t enjoy doing. And what do we hate most that… taking exams! Evaluation is another field taking Serious Games further. Imagine studying complicated medical questions day after day to prepare your final tests. Wouldn’t it be better to review your knowledge while compiting in trivia games against other students or even your professors? No only preparing for exams but also medical diagnosis is now using evalutional serious games. For example AULA is a test to detect TDAH in children. Instead of being asked questions by the doctor, kids play a game that simulates the classroom environment. While they engage with the game, the software registers when and what exactly distracts the player more easily. Data is gathered to create a personalized diagnosis allowing parents, doctors and teachers to focus in more accurate solutions. Probably Human Resources teams will be very soon using video games to evaluate potential candidates. A few minutes playing a video game could reveal if candidates have the basic skills for the job avoiding the nerves. Only those capable of passing the test would move to the next step in a face-to-face interview. This could save human resources professionals a lot of time and resources. Imagine no more candidates lying in their resumes about their German or computer skills! So what failures do you find in the MAPPLE clasification? Can you name any other category we are missing here? Please write about it in the commentaries below!